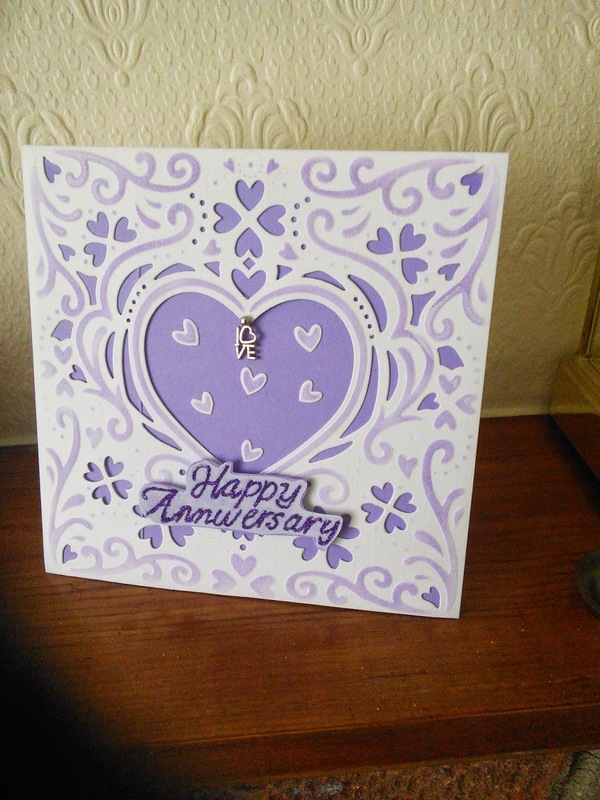 I used a create a card die and sponged through it with lilac ink and backed it with lilac card. The little hearts were the waste and the metal love charm came from The Works. We went out for a lovely lunchon Saturday at a mill house overlooking an estuary with lots of swans and in the evening we babysat while Lara hosted a dinner and dance evening at a restaurant in Port Solent. Created using some diecuts and freebie toppers from my stash. Congratulations for your anniversary - it sounds as if you had an action packed weekend. You've made some lovely cards in varying styles. Gosh, I've been trying to leave a comment all day but blogger has been playing up!!! What a lovely haul of cards you've got here. Great to see everyone yesterday. Oh my goodness what a lot of celebrations and luncheons...sounds divine :0) Gorgeous cards Val, especially love the afternoon tea card for Lara, lots of detail and so pretty. Congratulations for your Wedding Anniversay. Looks like you had a fantastic weekend. The cards all look wonderful. Hi Val. Happy Anniversary to you and Jim!! 44 years is a lot to celebrate --- congrats. what a wonderful set of cards, val! Well congratulations ( belated ) of course for your wedding anniversary, is it possible you have been married so long you look soooooo young. All of the cards are fabulous but must confess my favourite is for your hubby I love the delicate tones on this and of course all of those little hearts. Sounds like you had an amazing few days surrounded by friends and loved ones.